Join us for the Shabbat of a lifetime November 2-3, 2018! Excitement is growing for the annual Shabbat Hebron scheduled for the weekend of Parshat Chayei Sarah. The weekly Torah portion that discusses the ancient Jewish city and the Tomb of Machpela is the perfect time to visit the holy site, and thousands do so every year. The Hebron Fund's special program for English speakers offers the opportunity to experience this unique Shabbat with trained tour guides, special catered meals and the chance to interact with members of Knesset and top movers and shakers on the scene such as Caroline Glick and Eugene Kontorovich. 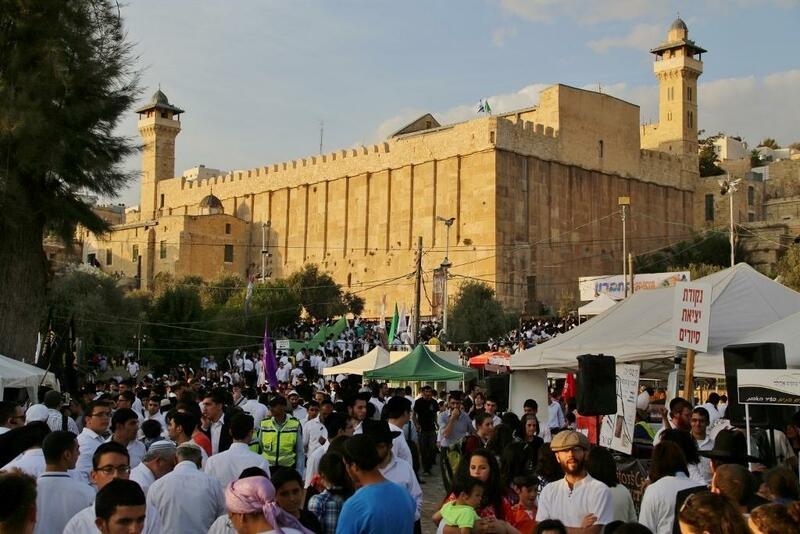 Shabbat Hebron has humble beginnings in the 1990s and today has grown to thousands with last year's weekend breaking the record at 35,000 people. The highlight of course is the Tomb of Machpela complex, built 2,000 years ago by King Herod the Great to house the Cave of the Matriarchs & Patriarchs. The atmosphere of Shabbat Hebron is both festive and with a sense of purpose. Tents dot the lawn across the the Cave of the Patriarchs as people camp out and picnic for Shabbat. Of course the reading of Parshat Chayei Sarah takes on a greater significance, as one stands in the Tomb of Machpela while hearing of our Abraham purchased the site as a final resting place for his beloved wife Sarah. After Shabbat, the festive scene continues as music fills the streets from BBQs. Thursday and Friday programing- $100 per day, per person. Cant join us? Give soldiers a break. Contact our office for sponsorship opportunities.